"Little men with big ideas..."
As the young girl runs from the barn in the direction of the house, Charles has no choice but to flee once again, before she raises the alarm and his pursuers are alerted. He burst through the opposite door, choosing his next direction without pausing. Description: The barn from which Charles emerges is connected to Netherdale Farm in the heart of the Monsal valley. Where is it? : The public footpath which passes along two sides of Netherdale Farm runs from the roadway, past the Farm and over the footbridge before winding leftwards under the viaduct. The second branch of the footpath runs down steeply from the Monsal head passing along the top edge of the Farm and past the gateway visible here. Where's the best vantage point? : The camera position used to film Charles' flight from the barn and run towards the footbridge is easily identifiable. What about access? 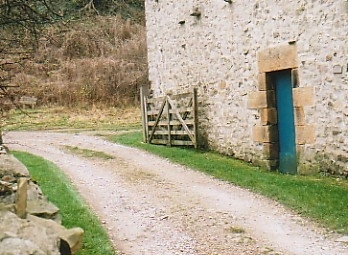 : The footpaths around Netherdale Farm are public, but the Farm itself is private property. All the exterior sequences can be observed from the footpath. Anything else? : Charles' meeting with the young girl appears to have been filmed inside the barn, although this has not been confirmed by fans.